The alkaline diet works. That is a fact. An irrefutable, scientific fact, as I am about to prove to you. The evidence for the alkaline diet is there and has never been stronger. But even without the science I know it works. I’ve seen way too many results in my life, in my family’s life, in my friends lives, and in the lives of the thousands of people I’ve coached, taught or had random emails from after they’ve actioned what I teach on this site. BUT, I know it’s important for people to see the science, read the facts and see the proof before they commit. And with more and more celebrities seemingly adopting this approach to health, there is the risk it’s going to be chewed and spat out by Hollywood and the media. So today I’m going to share my updated ‘Alkaline Diet Proof‘ catalogue with you. This is just a handful of the articles I’ve collected over the past 9 years (I’m a research geek from my academic days). Before I go into the specific research papers, I want to point out a few very important distinctions to make. A misunderstanding of these points (most critics of the alkaline diet make these mistakes and have these misunderstandings) leads to a complete misunderstanding of the alkaline diet, and worse, an impossible mountain to climb if you want to start living alkaline. You’re Not Trying to Alkalise Your Body: confused now? Let me explain. The purpose of the alkaline diet is not to try and increase the alkalinity of your blood, cells or any other part of your body. This is the chief ‘told you so’ point of the detractors of the alkaline diet. They say ‘there’s no point doing the alkaline diet because the body has mechanisms to ensure you NEVER deviate from pH 7.365’. I agree – that’s exactly the point. The purpose of the alkaline diet is to celebrate that fact and provide the body with all the tools it needs to effortlessly maintain that pH 7.365. The Standard American (Western) Diet and modern life in general bombards our body with acids all day long. The damage that these acidic substances (such as sugar) cause is only beaten by the damage caused by the body doing whatever it takes to buffer these acids and maintain the pH 7.365. The alkaline diet is designed to limit these acidic substances and fuel your body with an abundance of nutrient-dense, life-giving foods that make your thrive. It’s NOT designed to try and increase the alkalinity of your body, rather to support the body’s own delicate balance. I have explained this in more detail in my Alkaline Diet Myths article here. This is the second important point: the alkaline diet JUST MAKES SENSE! Try not to get too caught up in the science of it all. The scientific proof and scientific background of the alkaline diet is there, that’s without question – but don’t fall into the trap of not seeing the wood for the trees! The alkaline diet is really simple and common sense. When people (friends, family, doctors, other websites, troublemakers(!) and the like) try to question the alkaline approach, they usually go headfirst into a bunch of psudoscience, fuzzy logic and chemistry (largely based upon the incorrect assumption outlined above). But let’s take a step back for a minute and not call it the alkaline diet. Let’s just call it your new healthy living idea. Crap like sweets, confectionary, chocolate, trans-fats, chips, pizzas etc. This is pretty much the alkaline diet in a nutshell – but find me a doctor who would not agree that this is a great, healthy way to live? They’d be crazy to say that this was unhealthy. The final point to make is this: conducting human health studies is very expensive and incredibly difficult. I doubt that there will ever be a long-term, human study specifically focused on the alkaline diet in general as an approach to health. However, many smaller but more specific studies have been undertaken to relate the alkaline diet to specific outcomes, conditions and benefits, and this is what you’ll see below. Article Title: Does correction of metabolic acidosis slow chronic kidney disease progression? “Recent studies support that dietary acid reduction with oral sodium based alkali or base-inducing food types add kidney protection to that provided by current kidney-protective interventions. Recent studies suggest that metabolic acidosis mediates nephropathy progression, and its treatment with the comparatively inexpensive and well tolerated intervention of dietary acid reduction holds promise to be an additional kidney-protective strategy in CKD management. “Acidosis is prevalent among renal transplant recipients (RTRs) and adversely affects cardiometabolic processes.In addition to conventional factors contributing to acidosis, diet might influence acid-base homeostasis in RTRs. Higher intake of fruits and vegetables and lower animal protein intake is associated with less acidosis in RTRs (renal transplant recipients). Modern diet is devoid of alkalinity and the compounding effect of chronic acidosis leads to a host of problems in the body. “The modern Western-type diet is deficient in fruits and vegetables and contains excessive animal products, generating the accumulation of non-metabolizable anions and a lifespan state of overlooked metabolic acidosis, whose magnitude increases progressively with aging due to the physiological decline in kidney function. In response to this state of diet-derived metabolic acidosis, the kidney implements compensating mechanisms aimed to restore the acid-base balance, such as the removal of the non-metabolizable anions, the conservation of citrate, and the enhancement of kidney ammoniagenesis and urinary excretion of ammonium ions. These adaptive processes lower the urine pH and induce an extensive change in urine composition, including hypocitraturia, hypercalciuria, and nitrogen and phosphate wasting. Even a very mild degree of metabolic acidosis induces skeletal muscle resistance…and dietary acid load may be an important variable in predicting the metabolic abnormalities and the cardiovascular risk of the general population, the overweight and obese persons, and other patient populations including diabetes and chronic kidney failure. High dietary acid load is more likely to result in diabetes and systemic hypertension and may increase the cardiovascular risk. Results of recent observational studies confirm an association between insulin resistance and metabolic acidosis markers, including low serum bicarbonate, high serum anion gap, hypocitraturia, and low urine pH. An adoption of the “HFV” diet that replicates the alkaline diet (lots of vegetables, fresh foods and no red meat, processed foods, sugar etc) has been proven to slow and turn around type-2 diabetes. Authors: Katherine Esposito, Christina-Maria Kastorini, Demosthenes B. Panagiotakos, and Dario Giugliano. High acidic, low alkaline diet leads to cortisol production, known to dramatically increase the risk of obesity and type 2 diabetes. An acidic diet can be a contributor to renal (kidney) problems, and dietetic intervention with alkaline foods and substances can be advantageous. Alkaline Water helps to relieve and remove acid reflux and provides good acid-buffering capacity. Article Published: Ann Otol Rhinol Laryngol. 2012 Jul;121(7):431-4. “In addition, human pepsin remains stable at pH 7.4 and may be reactivated by hydrogen ions from any source. Thus, most tap and bottled waters (typically pH 6.7 to 7.4) would not be expected to affect pepsin stability. The purposes of these in vitro studies were to investigate whether artesian well water containing natural bicarbonate (pH 8.8) might irreversibly denature (inactivate) human pepsin, and to establish its potential acid-buffering capacity. The pH 8.8 alkaline water irreversibly inactivated human pepsin (in vitro), and its hydrochloric acid-buffering capacity far exceeded that of the conventional-pH waters. Unlike conventional drinking water, pH 8.8 alkaline water instantly denatures pepsin, rendering it permanently inactive. In addition, it has good acid-buffering capacity. Thus, the consumption of alkaline water may have therapeutic benefits for patients with reflux disease. An alkaline diet leads to a higher alkaline urine, providing an effective treatment of Hyperuricemia / Gout – alkalising helps remove uric acid from the body. “Within the framework of the Japanese government’s health promotion program, we made recipes which consisted of protein-rich and less vegetable-fruit food materials for H+ load (acidic diet) and others composed of less protein and more vegetable-fruit rich food materials (alkaline diet). Among the five factors which are associated with calculating clearances for both uric acid and creatinine, we identified a conspicuous difference between acidic and alkaline diets in the uric acid concentration in serum as well as in urine; uric acid in the serum was higher in the acidic group than in the alkaline group, while uric acid in the urine in the acidic group was lower than that in the alkaline group. These changes of uric acid in acidic urine and in serum were reflected in the reduction of its clearance. From these observations, it is considered that uric acid may be reabsorbed more actively in acidic urine than in alkaline urine. A diet rich in alkaline forming foods supports bone health and has been proven by numerous human studies. Article Published: European Journal of Nutrition. 2001 Oct;40(5):238-44. Alkaline water supports bone strength by eliminating bone resorption (weakening) and is especially more powerful than acidic water, even if the acidic water contains calcium. Thus supporting the hypothesis that acidic substances don’t necessarily promote bone health even if they contain calcium (i.e. milk). Article Published: Bone. 2009 Jan;44(1):120-4. doi: 10.1016/j.bone.2008.09.007. Epub 2008 Sep 26. Authors: Wynn E, Krieg MA, Aeschlimann JM, Burckhardt P.
Alkaline water and diet inhibit bone resporption (bone weakening). Alkaline water is specifically show in this research to outperform acidic water. “Alkali supplements decrease bone resorption and increase bone mineral density. Alkali diets also lower bone resorption. Mineral waters alone could have such an effect. In several subsequent studies in humans, bicarbonate-rich alkali mineral waters with low potential renal acid load values were shown to decrease bone resorption markers and even parathyroid hormone levels. This effect seems to be stronger than that of acidic calcium-rich mineral waters. Proof that consuming alkaline minerals DOES have an effect on acid-base chemistry – the alkaline diet DOES have an impact on our health! An acidic diet can increase the liklihood and intensity of pain, but a more alkaline diet can reduce this pain, specifically chronic back pain in this case. “It was tested whether a supplementation with alkaline minerals would influence symptoms in patients with low back pain symptoms. In 76 out of 82 patients a reduction in ARS (Arhus low back pain rating scale) was achieved by the supplementation. Total blood buffering capacity was significantly increased … and also blood pH rose … The results show that a disturbed acid-base balance may contribute to the symptoms of low back pain. The simple and safe addition of an alkaline multimineral preparate was able to reduce the pain symptoms in these patients with chronic low back pain. “Bicarbonate has been implicated in bone health in older subjects on acid-producing diets in short-term studies. Bicarbonate…had a favorable effect on bone resorption and calcium excretion. This suggests that increasing the alkali content of the diet may attenuate bone loss in healthy older adults. An acidic diet creates metabolic acidosis, leading to muscle wasting and a reduction in lean muscle tissue. This can be corrected with a high intake of foods containing alkaline minerals such as potassium (alkaline foods). Proof: The Alkaline Diet Works! An overly-acidic diet (dietary-induced acidosis) is real, has a devestating effect and should be corrected with diet (alkaline). Article Title: Diet-induced acidosis: is it real and clinically relevant? Article Published: British Journal of Nutrition. 2010 Apr;103(8):1185-94. doi: 10.1017/S0007114509993047. Epub 2009 Dec 15. Article Title: Sodium bicarbonate improves swimming performance. Article Published: Int Journal Sports Medicine. 2008 Jun;29(6):519-23. Epub 2007 Nov 14. Authors: Lindh AM, Peyrebrune MC, Ingham SA, Bailey DM, Folland JP. This is just a handful of the research that exists out there. It is available in abundance. Of course, I will keep adding to this section of my site each few weeks, but for now, this is certainly enough to be going on to prove to yourself and others that the alkaline diet is REAL, it WORKS and it’s PROVEN to be beneficial to human health! Next Steps to Get Alkaline! 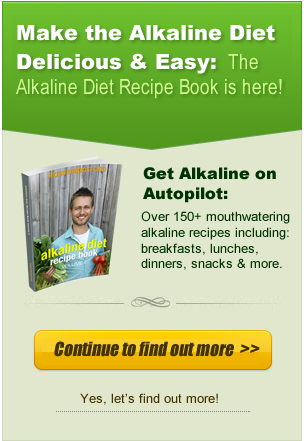 PLUS – I strongly recommend you check out my Alkaline Diet Recipe Book! If you have any research you’ve found for yourself, feel free to let me know in the comments section below this article! Excellent work, I’m also a CHNP and holistic health and healing minister through acid alkaline balance. The information you have given here is absolutely amazing and dead on. I myself have experienced what this powerful way of life can do in life. I took a look at the scientific proof but I did not see anywhere any PH mentioned. The scientific articles were not free to read. So I think those articles were about healthy eating in general? And everyone knows that it works. PH diets are simply very similar to the traditional health diets. I eat healthy myself and I eat accordingly with the PH diet, simply because it is generally known what is healthy and what not. I am a 73 year old male who was diagnosed 2 months ago to have leukemia (CMML type). To try to assist my body with any recovery possible, I have begun an alkaline diet. My early tests show that I was very acid. Gradually, with the new diet that I have learned from you, my acidic condition is turning more toward the alkaline side. Hi Dan. Are you still on an alkaline diet? And how is your CMML? My fiancé’s mom was diagnosed and I’m doing some research for a diet recommendation for her. I hope you are doing treat and thank you! Pingback: The One Foolproof Step to Get You Alkaline - with No Hard Work! Great article Ross, very well written! Great article! Thanks so much for posting. Brilliant info. I feel it is always great to see the evidence basis for health related interventions we make in our modern lifestyle. ( we seem to need this to justify it!) Very helpful evidence to show my doctor who believes that drugs are the best way to treat osteoporosis. Isn’t it interesting that eating the foods promoted by “the alkaline diet” are of course what humans were designed to/have evolved to eat, so it makes complete sense that they promote health.